When I was a kid and could only dream about being unhinged from Earth, I assumed all airplanes could fly in three, full dimensions. Every pilot knows that’s the definition of flying, but only to a limited extent. As a government brat living in a suburb of Washington D.C., I used to ride my bike a few miles to College Park Airport, the world’s oldest continually operated airport since 1909, to watch the parade of airplanes circling the pattern and landing again and again. I remember being struck by the fact that the airplanes never seemed to maneuver very much, but I knew they could if their pilots commanded them to do so. Next stop was Anchorage, Alaska, where, once again, the traffic seemed to follow strict rules of pitch and roll. And, again, I knew that wasn’t all there was. In fact, I didn’t fully appreciate the limits of normal flying until my first flight. Riding in a Cub on skis out of Anchorage’s Merrill Field, I assumed it wouldn’t be a problem to lift off, climb a few hundred feet and roll inverted, just as I’d seen the F-86 Sabre jets do during an airshow at nearby Elmendorf AFB. The Cub’s owner made it clear that wouldn’t be a good idea in his Cub, though most Cubs are probably physically strong enough to perform limited aerobatics. The owner explained that his airplane was approved in the “normal” category, not aerobatic. That limited it to 30 degrees of pitch and 60 degrees of bank unless you’re carrying a passenger and wearing a parachute. If you fly a standard general aviation airplane, you must fly within fairly narrow parameters of pitch and roll. In other words, you can’t maneuver the airplane as freely as you might wish. Inverted flight is a no-no, and any steep climb or dive is out of the question. The owner also explained the concept of G-limits and the fact that his Cub was restricted to 3.8 positive Gs. Owner Floyd Threet also mentioned that airliners are even more restricted, They’re so heavy, they can only pull a maximum of 2.0 Gs and can’t bank much beyond 45 degrees. What a disappointment. The vertical element was so severely restricted, it seemed all you were allowed to do with a normal-category aircraft was take off, fly from airport to airport and land. Flying around the Chugach Mountains north of Anchorage was an entrancing experience and loads of fun, but it was one dimension short of exciting. There had to be more to flying than simply departing and arriving, often at the same airport. It was several years later that I learned the thrill of aerobatics, admittedly a little muted by the fact that my first hop in limited 3D was in a beat-up, very tired Citabria, a legal aerobat, but just barely. With only 150 hp to protect it from evil and no inverted fuel or oil system, the Citabria couldn’t maintain inverted flight for more than a few seconds, and any vertical maneuver demanded considerable help from inertia to struggle through successfully. Initially, that was acceptable. I didn’t take up aerobatics for any noble purpose. I did it because flying didn’t seem truly complete and free form unless I could experience the sky as the birds see it—straight and level, inverted, straight up, straight down, knife edge and every attitude in between. At the time, I didn’t worry much about whether acro would make me a better pilot. I just wanted to become familiar with as many variations of flying as I could. After another 10 years and a few new licenses and ratings, I’d stepped up to more capable aerobatic birds such as the Great Lakes biplane, the Super Decathlon, Extra 300, Pitts S2A and a few other types, all more talented at conquering the sky than I’d ever be. Substituting enthusiasm for skill, I gradually moved on in my vertical and inverted education to considerably quicker-handling machines and a variety of new maneuvers. I started with loops, Immelmanns, Cuban 8s and Split S’s along with the gamut of rolls—barrel, slow and point—then, initiated variations on those basic themes, vertical rolls, loops with a snap on top, hammerhead stalls and some other maneuvers no one had ever seen before. I was infected with the joy of being free at last. Good God almighty, it felt good. Finally, I began to understand a little about the real world of flying, the full freedom to operate in all three dimensions rather than just two-and-a-half. Eventually, my list of maneuvers included the incomprehensible lomcevak, allegedly the Czech word for “headache.” This is a fairly low-speed maneuver that relies on gyroscopic precession and torque to cause the aircraft to tumble end over end. The maneuver was invented by Ladislav Bezák, a Czechoslovakian unlimited acro pilot. Probably everyone who’s watched a major airshow has witnessed a lomcevak. 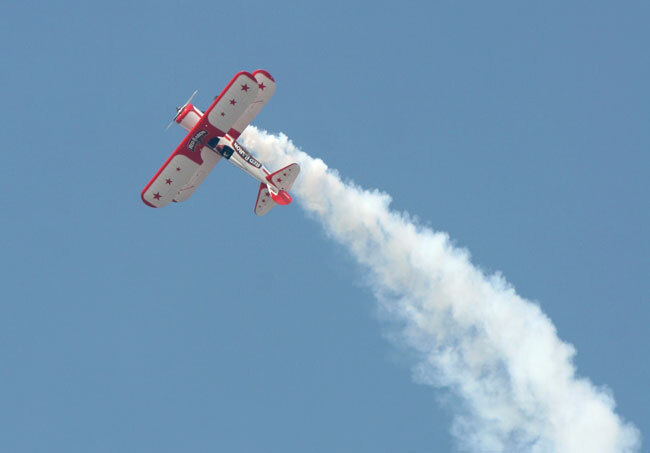 It’s a nose-over-tail, outside tumble, often performed by folks such as the late Clint McHenry and Bob Herendeen, the amazing Sean Tucker and fellow P&P columnist Patty Wagstaff, the Simone Biles of aerobatics. Patty can do things with her Extra 300 that you wouldn’t believe possible. Art Scholl, the dean of airshow pilots who was killed during filming of second-unit footage for the movie Top Gun, used to say the easy part of a lomcevak was memorizing the entry technique. For the recovery, Art advised that you should simply “wait until the airplane does something you recognize.” That something was most often an inverted spin. I practiced the lomcevak in a Pitts S2A, a wonderful, little, aerobatic biplane that was built hell-for-stout and more airplane than I was a pilot. Lomcevaks were tough on the engine mounts and prop of an airplane, not to mention the pilots. It was an extreme outside maneuver, and they were officially frowned upon by the few FBOs who rented trainers capable of performing them. For that reason, Dan Gray, my instructor at the Pitts Stop in Santa Paula, California, limited our lomcevak training to only two or three repetitions per session. Dan liked to perform the lomcevak from knife-edge flight, and that’s the way he taught me to fly them. It made for a wild ride, often through both horizontal and vertical outside tumbles, violent enough that I was grateful to only have to practice them three times per session. If I had any doubts about the ability to fly using all the laws of physics, the lomcevak dispelled them. In the interest of full disclosure, I’ve never had the desire to try a lomcevak solo, but practicing it did bridge the gap into what seemed a fourth dimension of free flight. Unlike Patty Wagstaff, a diminutive, 100-pound G-monster who seems to live for innovative acro, I’m content with having explored, however tentatively, my personal aerobatic limits. I’m twice Patty’s weight with a quarter of her talent and intestinal fortitude, but I’ve seen what’s possible at the outer limits of human performance and endurance, at least, for this human. As of January 1, 2016, Senior Editor Bill Cox has logged 15,100 flight hours in 321 types of aircraft. He also holds 28 world city-to-city speed records, has made 211 international delivery flights, and owns and flies a LoPresti Mooney. You can email Bill at [email protected]. Just lately I find myself able to afford a new unlimited acro machine.I need to check out my neck’s ability to withstand side loads. I sent 2 emails to Patty asking about going up with her or someone else to work up to maybe a double inverted snap at the bottom of a outside loop. I have about 20000 hours, Alaska bush and non sched, Laos Turbo Porter, Scratch built GL checked out people in S3B and 340 hp Eagle. Scared the crap out of myself doing a 1/2 spin in my 3rd hour of solo picking up a low wing on a J3 with rudder as I stalled. Ended up spinning from 10K to 1500 ft and loops 4 hours later. Later project certification test pilot on CFM56-5 that went into Hudson. Any suggestions to test neck?